For nearly 50 years, Johnson County Community College has served thousands of people in our region on their quest to achieve higher education. To continue to serve and meet the needs of our students and community, JCCC Foundation invites you to join our capital campaign: The Campaign for Tomorrow. JCCC serves everyone from high school students getting a jump-start on college to experienced workers developing skills for new careers later in life. As we near our half-century milestone, JCCC is preparing itself to serve our students and the community for the next 50 years. We continue to do all we can to strengthen our community by providing every student with the best possible chance for success in life. To prepare for that future, JCCC dedicated recent years to analysis. We completed an extensive strategic plan, an academic plan and our campus's first-ever Facilities Master Plan. The results of these in-depth studies illuminated the needs for expansion and renovation to meet the needs of the students and our community. The JCCC Foundation initiated The Campaign For Tomorrow as its private fund drive. The mission of JCCC is to inspire learning to transform lives and strengthen communities. To achieve this mission, our facilities must be innovative, flexible and functional. This initiative has one goal: ensuring that we keep our students' needs front and center as we invest for the future. We're altering our campus landscape to cultivate innovative learning and engagement opportunities while integrating the interactive needs of our award-winning faculty and staff. JCCC invites community organizations, businesses and individuals to support current construction projects, renovation plans and scholarships/programs. To learn more, call 913-469-3835 or email the foundation. Host corporate, association or community information sessions. Donate as an employee, individual, organization or corporation (any amount). Establish a named scholarship ($1,000 minimum) or an endowed scholarship ($10,000 minimum). Include the JCCC Foundation in your estate plans. Recently, the Foundation received a $10 million challenge gift from the Sunderland Foundation as well as $2 million from Hugh L. Libby and a donation from Drs. David and Mary Zamierowski. 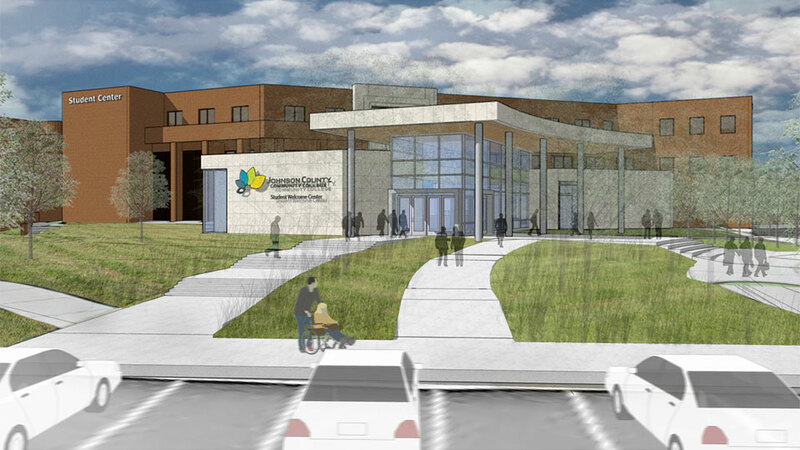 Now through 2020, JCCC will transform its campus for the next 50 years. With the construction of two new buildings — the CTEC and FADS — JCCC is creating campus neighborhoods full of synergy that will continue to inspire learning, transform lives and strengthen our community. Conceived in 1981, our current industrial technology facility shares space with JCCC fine arts studio courses. Known as ATB (Arts and Technology Building), its outdated laboratories limit the functionality for our students and their training needs. The new facility, currently under construction, will be approximately 69,000 square feet and will be sited northwest of the Industrial Training Center (ITC) building. It will house training for automotive technology, electrical technology, industrial maintenance, and heating, ventilation and air conditioning. The state-of-the art facility will be comparable to facilities at many Johnson County high schools and will provide a better stepping stone to those students. The open, modular design will allow JCCC to be flexible and respond quickly with course offerings in new areas that come on the scene, such as robotics and advanced manufacturing. The additional space will not only allow us to offer more classes, more personalized training and additional upgraded machinery, but it will be available to Continuing Education students as well. This will further enhance the industrial programs' ability to respond to workforce needs. Economic studies support the enhancement of these programs. Industrial tech companies across the board are facing a shortage of workers due to the growth of these areas coupled with retirement-driven attrition of the current workforce. This new facility at JCCC will significantly increase the exposure and profile of these industrial opportunities and help recruit talent to these fields. The fine arts classrooms in the Arts and Technology Building (ATB) experience similar facility limitations as our industrial technology programs. The 1980s building that the two programs currently share has simply reached its use capacity. The fine arts studios will benefit significantly from a redesign of studio space to modern standards. The studios need improved ventilation and new equipment, and should be co-located with other arts-related fields on campus. This concept of creating 'campus neighborhoods' by promoting adjacencies was a goal of the Facilities Master Plan. The relocation of the fine arts programs will perhaps be our best achievement toward this goal. The new building, currently under construction, will be approximately 37,000 square feet and will contain all fine arts programs now in ATB as well as graphic design and filmmaking. The building is sited northwest of the Wylie Hospitality and Culinary Academy, which will create an Arts Neighborhood on campus, with our performing and visual arts facilities – the Carlsen Center and the Nerman Museum of Contemporary Art – completing the quad. The visibility of this location, coupled with its modern design, will increase exposure and encourage enrollment in the creative arts, an industry that's crucial to the future of Kansas City's economic growth. After the fine arts and industrial technology programs move into new facilities, the Arts and Technology Building (ATB) and the neighboring Welding Lab Building (WLB) will be renovated to accommodate JCCC welding and general welding for BNSF Railway, as well as for needed space to support Campus Services. BNSF instructors currently teach welding in metal buildings located north of WLB. With more permanent space provided after the renovations, JCCC will be able to remove the current metal structures. This renovation further strengthens our community’s relationship with BNSF as its national training headquarters. Surrounding businesses such as hotels, restaurants and retail shops rely heavily on this partnership. Improving our welding facilities to better serve the partnership is a direct benefit to our community at large. This project involves enhancements to the Student Center and to the north side of campus to strengthen the Student Center as the first stop for students and visitors. The project scope includes moving the Welcome Center and the Bursar function to the first floor of the Student Center, changing the exterior façade on the north side of the building, and reconfiguring roads and parking for better wayfinding. This will help our community better navigate our expanding campus and better access the student services they need to complete their education. The ‘Front Door’ project also calls for the creation of JCCC’s first outdoor sports complex. This involves moving the softball field and soccer fields to the north entrance of campus, in the location currently occupied by the track, and adding parking for athletics and a building to contain public restrooms. This project is important as it will not only benefit JCCC athletics but will maximize JCCC’s space and location within the metropolitan region and beyond for leagues, tournaments and other potential rental income and service to our community. The College’s five Resource Centers — Academic Achievement, Language, Math, Science and Writing — will be consolidated on the first floor of the Billington Library. Currently, the five centers are located in four different areas, which is an unnecessary burden for our community. National studies show that this renovation to a unified academic support destination will improve the success of our students in all areas. This area will continue to be a priority, as many major projects are already underway. As an all-electric campus, investments in this areas have competitive payback timelines. Examples include our pursuit of LED lighting throughout campus as well as solar panels on campus rooftops. Taking advantage of sustainability opportunities makes both environmental and fiscal sense for our campus and community. Many more opportunities exist in this area. The JCCC Foundation continues to celebrate growth in these areas, but annual statistics show that only one-fourth of Foundation applicants receive scholarship support of any kind. Closing this gap to improve access to higher education is the cornerstone of the Foundation’s mission. One are of potential opportunity is endowed professorships. Currently, the College has one partially endowed professorship.